Soups,the most comforting foods are prefect to enjoy without any guilt while the weather is too down, the weather in Paris is just unimaginable, one day its too hot and suddenly the next day its too chilled. Obviously we are having hard time to decide how to dress up ourselves. Since yesterday, the weather is too cold and our dinner goes obviously to a warm bowl of comforting soup. I usually add potatoes to my soup to make them thick but for a change i tried adding dals in a simple broccoli soup.The addition of the dals in the soup makes this bowl of creamy broccoli soup more interesting and simply delicious. To make this simple broccoli dal soup even more delicious, i have added some low fat cream to give a creamy texture to this soup. 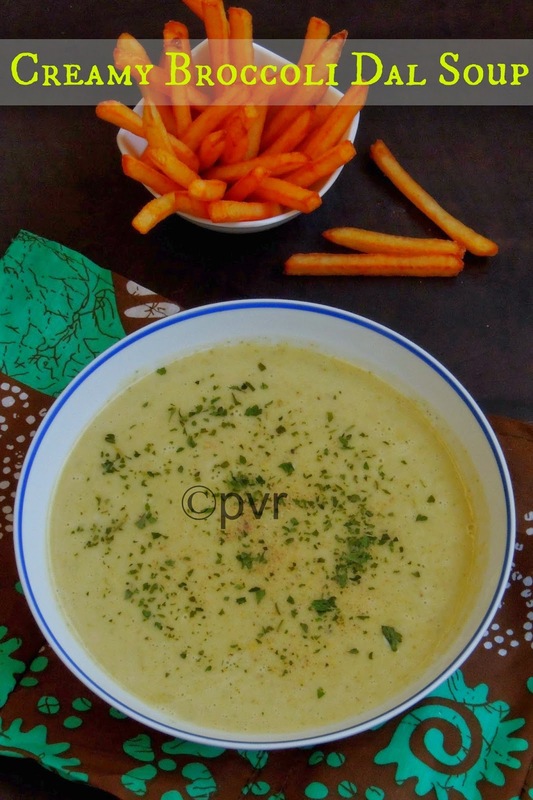 I served this soup just with french fries for our dinner, trust me everyone at home just finished their bowl without any fuss.As you all know, am running my third week of blogging marathon with soups and salads with sides a theme and this delicious creamy soup is my last post for this week's blogging marathon as i served this bowl of delicious soup with addictive french fries.Sending this bowl of comforting soup to my event Healthy Diet-Soups and Salads hosted by Rafeeda.Check out the Blogging Marathon page for the other Blogging Marathoners doing BM#38. Heat enough oil in a pressure cooker,saute the chopped onions until the onions turns transculent. Add in the broccoli florets, saute for few minutes. Add in the washed yellow moongdal, vegetable stock and salt. Pressure cook it for 3whistles. Once the steam gets released, blend the cooked broccoli-dal mixture as smooth paste. Now add the cream,pepper powder, dry parsley leaves. Add in water if needed, cook in simmer for few minutes. The soup looks comforting, but can't take off the eyes from the fries on the side. Priya, that's such a comforting bowl!..very nice and what's on the side?..that looks so tempting as well hheheh..
such a creamy soup.. Lovely! thats very healthy 1.. never tasted it.. Very nice One, I loved the dal addition damm good . Very nice and coincidentally my daughter made a carrot lentil soup yesterday. Plan to blog that soon. Using dal to thicken the soup sounds healthy & delicious. Lovely bowl of soup. Creamy and delicious. This combination of dal and broccoli sounds very interesting Priya, healthy one too, looks comforting and delicious! I love broccoli soup. This is bookmarked and using dal is quite interesting.